The 2007 South African HORROR FESTACULAR is here again to liven up your Halloween period! A wide range of movies have been selected, and as usual it covers the far reaches of the planet, from the USA, UK, and Italy, to Germany, Switzerland and even Pakistan! The HORRORFEST is the only festival of its kind in Southern Africa offering fans the rare chance to catch a great selection on the big screen, from older classics and fan favourites to brand new independent features you won't see in theatres, or even at your local video store. There is also of course the inclusion of a silent classic with an original soundtrack performed to the screen by local artists. As an opening treat on Thursday 25 October (8:30pm) viewers can catch a FREE sneak preview of the forthcoming chiller CAPTIVITY (a month before it hits theatres). Come early. The historic Labia Theatre is again the host venue, and one of the few cinemas where you can take your drinks from the bar into the theatre(!). On Saturday 27 October the PlayStation Pod will be outside The Labia, loaded with Horror games. Each screening will have a range of give-aways for viewers, including horror DVDs and posters, CDs, Hostel II sling-bags, Something Wicked Magazines, PlayStation and Halloween goodies (courtesy Sting Home Entertainment / Ster Kinekor / Something Wicked / Party Tricks / Plastic Bat / Gresham & RoadRunner Records). Viewers are encouraged to dress up in their chosen Halloween get-up for all screenings, but at the live music performance to DR. CALIGARI on Halloween night, the best dressed HORRORFESTER will be chosen and walk off with some cool prizes. The new HORRORFEST T-shirt and others will also be on sale. The 2007 HORRORFEST will also celebrate the 1st birthday of SOMETHING WICKED MAGAZINE. The party is set for 3pm on Saturday 27 October at the Labia Theatre. 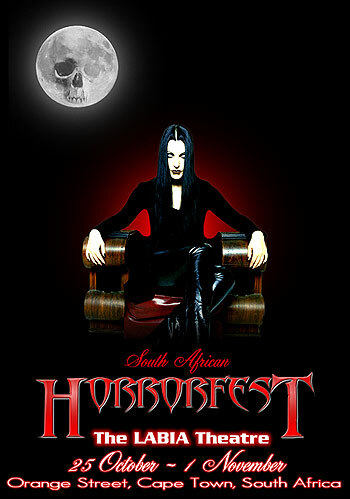 Unfortunately the plans to get the HORRORFEST up to the northern regions of South Africa this year didn't work out. But, don't fear, there are a few other avenues by which we plan to bring it to the rest of the country by next year. The Short Film competition consists of both a Foreign- and South African-made category, with the best local production again walking off with a great prize worth around R17 500 from VISUAL IMPACT and the HDhub. A best foreign short will also be appointed. (SHADOW REALM Vol. III - Part 1 : South African entries / SHADOW REALM Vol. III - Part 2 : Foreign entires). Allow the scrolling gallery below of the many movies screened at the S.A. HORRORFEST to load. Click the movies of your choice to buy them from Amazon.